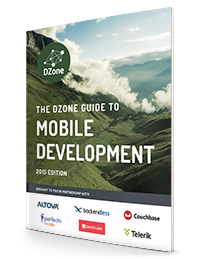 Today, we are happy to release The DZone Guide to Mobile Development – 2015 Edition! We can’t answer every question for you. The mobile market is too mobile for that. But we can give you enough information about the mobile development landscape to simplify your decisions and make your mobile-first coding easier. Our Guide includes views from developer, user, and infrastructure perspectives; a sweet listing of platforms and frameworks to facilitate mobile development; plus a fun glance at pain points encountered by mobile developers. The second DZone Guide to Mobile Development addresses the questions: How are developers building mobile applications, and how can developers build better mobile applications with less pain and greater user satisfaction? We’ve also learned a lot about the best Mobile Application Development Platforms and Mobile Web Frameworks, and we’ve assembled our tried and true solutions directory with tons of data on over 40 MADPS and web frameworks.